I recently enjoyed watching Words and Pictures, a 2013 film about a male English teacher and a female art instructor who form a rivalry that ends up galvanizing students in a competition to decide the most effective way to communicate, using words or pictures. This battle between mind and heart, ideas and feelings, is also about self-discovery, expressing one’s creativity, and the blocks that get in the way. Cleverly written by Gerald Di Pego, a one-time English teacher, and faithfully directed by Fred Schepisi, it stars Clive Owen, Juliette Binoche, and Bruce Davison. Visit their website for more info: http://wordsandpicturesthemovie.com. I especially liked the quotes about writing and art, the word vs. the image. A poem by Mary Oliver was supposed to be featured in the film. They never said which one, but kept waiting for permission to use it. By the time the answer came in, no, it was too late, and they had to come up with a replacement. The pressure was on screenwriter Gerald Di Pego. Being a poet himself, and seeing how this was his screenplay, the muse inspired him and he wrote this very vivid and appropriate poem, just in time. Juliette Binoche liked it, which came as a relief to him and the director. I found it online and wanted to share it with you. The poem plays a central role, but you’ll have to see the film to find out who wrote it and how it’s used. As you can see, the poem invites you to create and become who you are, from that gap, the transitional point of possibility, and to share in the experience with another. Here’s a poem I wrote after a special painting class that seems relevant: ArtWords—poem about a creative awakening. Interestingly, the Special Features part of the DVD revealed that Juliette Binoche, an artist in her own right, offered to do all of the paintings herself, which thrilled both writer and director. Because her character is dealing with physical challenges due to her medical condition, she had to paint in different styles, from portraiture to more abstract. Binoche enjoyed the added challenge and it possibly influenced her own future work. Here is the official Words and Pictures – International Trailer (2014) HD. When it comes to romantic movies, here are some of my favorite films where love transcends time. The featurette also confirmed for me where they had made the film. The story is set in a New England prep school, but was actually shot at St. George’s School, an independent boarding and day university-preparatory school for boys in Vancouver, British Columbia, Canada, a.k.a., Hollywood North. I recognized the location, and it reminded me of a story I had heard on a local CBC radio talk show during my stay there. The guest was an English teacher who taught at St. George’s School. One of the topics being discussed was meeting famous people. Listeners called in to share their stories and the teacher related an unusual event that had recently happened to him. He had gone shopping at a well-known store for comfortable walking shoes. He settled on a particular pair and the sales clerk told him it was a popular item. She said someone famous had been in that morning and purchased a similar pair. She left to find out the name of the celebrity, but got sidetracked, so he left. He put on his new shoes and, as was his routine everyday after lunch, he went for a walk in the woods next to the school property. While walking along the path, eyes downcast, he saw a pair of shoes just like his, coming his way. Looking up he saw someone he never would have expected to see, especially in the forest. He pointed at him in surprise trying to say his name, but it came out as gibberish. The person mimicked him sputtering his name. It was Robin Williams! I think he was in town at that time filming Jumanji. They had a wonderful walk and talk together. Robin had asked him what he did for a living and where he worked, which was something he could identify with having played an English teacher at an elite boys prep school in Dead Poets Society. When they reached the edge of the forest, there was Robin’s stretch limousine parked on the street waiting for him. He invited the teacher into the car saying they would drop him off at the school. Now this man was not the most popular teacher at the school. When they pulled up, he got out of the limo, and all heads turned to look at him. Then Robin lowered the darkly tinted window, stuck his head out, and thanked the teacher for a wonderful time. All the kids’ jaws dropped! And from that day on he was the coolest person at school. Thank you, Robin! God Bless you, wherever you are. Another small but profound poem by Hafiz is titled Riches Everywhere. Published in A Year With Hafiz: Daily Contemplations, and translated by Daniel Ladinsky, each poem is read for a specific day of the year. This poem, found on page 389, is dated for today, December 21. Don’t envy my talents, or seek them. to mine the jewels I have brought to town. you as if they were our Beloved. This poem reminds us to not covet other people’s wealth, but to find riches everywhere, most naturally within our own hearts. By loving those close to us as we would love God, our hearts come to know the divine within them, and ourselves, the only true and lasting riches. In loving, we come to be loved; we come to the Beloved. Other beautiful poems by Hafiz selected for posting on The Uncarved Blog are: Hafiz’s poem, God Pours Light, awakens the soul and frees the mind from debating words about it | Winding up the year with inspiration from Hafiz | 3 beautiful and profound short poems by Hafiz about the nature of God within us | Hafiz via Ladinsky describes the spiritual transformation of loving deeply within himself | For Hafiz the role of an enlightened poet is to connect humanity with the joy of the divine | Hafiz said to leave something in the marketplace, and Jesse Winchester sure did before he left us. Mark Strand, former U.S. poet laureate (1990-1991) and winner of the Pulitzer Prize for Poetry (1999), felt strongly that writing and reading poetry could make us better human beings. “Poetry helps us imagine what it’s like to be human,” he said in an Inscape interview last year. Last week, one of my poet friends, Roger Pelizzari, emailed me about the passing of Mark Strand, and included a favorite poem of his, My Name. Roger included a link to an earlier Paris Review interview: Mark Strand, The Art of Poetry No. 77, with his friend Wallace Shawn, from which I’ve included interesting excerpts. I was surprised and sorry to hear the news of Strand’s passing and checked the Paris Review for an update. I found Memoriam Mark Strand, 1934–2014, under The Daily by Dan Piepenbring, and sent it to Roger. This poem is filled with the wonderment he sought, and seems a fitting memorial, prophetically written in the poet’s own magical words. Here are 3 beautiful and profound short poems by Hafiz that reveal the hidden compassionate nature of God within us, and in a God-realized person. Published in “A Year With Hafiz: Daily Contemplations,” and translated by Daniel Ladinsky, each poem is for a specific day of the year. hidden in illusion, hidden as He can be, in us. “a song with no end” by Charles Bukowski, from The Night Torn with Mad Footsteps. © Black Sparrow Press, 2001. Here are two famous quotes I’ve admired that have to do with overcoming our fears, believing in ourselves, and having the courage to commit to our dreams, which then moves Nature to support us in ways we never would have imagined. They seem to be related in an important way — having the confidence and courage to commit to ourselves and fulfill our life’s purpose. The first quote, having the courage to overcome our fears to become our true self, is from Marianne Williamson’s book, A Return To Love. It’s often been mistakenly attributed to Nelson Mandela, who used it in his 1994 Inaugural Speech. Our deepest fear is not that we are inadequate. Our deepest fear is that we are powerful beyond measure. It is our light, not our darkness that most frightens us. We ask ourselves, “Who am I to be brilliant, gorgeous, talented, and fabulous?” Actually who are you not to be? YOU ARE A CHILD OF GOD. Your playing small does not serve the world. There is nothing enlightened about shrinking so that other people won’t feel insecure around you. We were born to manifest the glory that is within us. And as we let our light shine we unconsciously give other people permission to do the same. As we are liberated from our own fear, our presence automatically liberates others. This second quote, on commitment, was thought to have been written by Goethe, but it is from William H. Murray, author of The Scottish Himalayan Expedition (J.M. Dent & Sons Ltd, London, 1951). Until one is committed, there is hesitancy, the chance to draw back. Concerning all acts of initiative (and creation), there is one elementary truth, the ignorance of which kills countless ideas and splendid plans: that the moment one definitely commits oneself, then Providence moves too. All sorts of things occur to help one that would never otherwise have occurred. A whole stream of events issues from the decision, raising in one’s favor all manner of unforeseen incidents and meetings and material assistance, which no man could have dreamed would have come his way. Whatever you can do, or dream you can do, begin it. Boldness has genius, power, and magic in it. Begin it now. W. H. Murray’s book details the first Scottish expedition in 1950 to the Kumaon range in the Himalayas, between Tibet and western Nepal. The expedition, led by Murray, attempted nine mountains and climbed five, in over 450 miles of mountainous travel. You can read more about this on About.com: German Myth 12: The Famous “Goethe” Quotation. I just came across a similar post by Joseph Ranseth: 3 of the Greatest Quotes – W.H. Murray, Henry David Thoreau & Marianne Williamson. Ranseth cites the more complete Murray quote in context, where he describes the initial steps he and his party were taking before they actually started the mountain-climbing part of the expedition. Their commitment and follow-through precipitated Providence moving in their favor, which explains how he came to write about the power of commitment and its results. Murray also acknowledged and paraphrased a translation of Goethe’s couplet at the end of his quote. The article also includes a selection from Thoreau’s Walden, Chapter 18. He also went in the direction of fulfilling his dreams when he chose to live self-sufficiently at Walden Pond. He described his opening up to deeper more universal laws of nature during his two-year seclusion and how that impacted his life. The quote ends with these famous lines: “If you have built castles in the air, your work need not be lost; that is where they should be. Now put the foundations under them.” But what proceeds them is quite profound. I recommend you read that section of the blog post. Watch Videos of MUM 2014 Graduation with Jim Carrey and see Some Reports on @JimCarrey’s Commencement Speech at MUM @MaharishiU #mumgraduation. Just received this beautiful poem, Love after Love, written by Derek Walcott. To me it’s about coming back to yourself, discovering and loving your self. It can be a sweet, quiet awakening, when you recognize it, open your heart to it, to who you are. I remember when it happened to me, living alone in a room I was renting in a house in North Vancouver. I finally let go of all the distracting reasons to search for happiness outside myself, in wanting to love another person or be loved by them, or some thing to do I thought would make me happy. I just stopped and discovered the loving stranger that was there, and accepted myself instead, as if for the first time. Took more than half my life for it to finally happen, but was quietly surprised and pleased when it did. Derek Walcott describes this process of self-recognition and acceptance so well, so powerfully. After a little research I discovered Derek Walcott to be an amazing man, an artist, poet, professor and playwright. Acknowledged as the greatest living poet in the English language, he won the Nobel prize for Literature in 1992. He taught at Boston University for 20 years. Turns out he also taught in Canada. In 2009, Walcott began a three-year distinguished scholar-in-residence position at the University of Alberta. In 2010, he became Professor of Poetry at the University of Essex. Born in Saint Lucia, Derek Walcott was influenced by his mixed racial and cultural heritage. He married a Trinidadian, raised a family there, and built the Trinidad Theatre Workshop. For someone who was in search of his own identity, both as a person and an artist, this poem represents a coming back to one’s essential self. It resonates deeply with the thousands who have read it. It was first published in Sea Grapes, and later in Derek Walcott, Collected Poems, 1948-1984, and The Poetry of Derek Walcott 1948-2013. Here are a few videos worth watching: a BBC documentary, Derek Walcott; an interesting Canadian TV interview, Nobel Laureate Derek Walcott on his life and work; and a poetry reading: Derek Walcott: The Perpetual Ideal is Astonishment | 92Y Readings. Here is a more recent poetry reading at the 92nd Street Y: Derek Walcott with Glyn Maxwell and Caryl Phillips. He reads Love after Love at 26:25. Listen to this excellent July 13, 2014 BBC Radio 4 interview where Nobel Laureate poet Derek Walcott talks about his life and work at home on St Lucia: Derek Walcott: A Fortunate Traveller (28 mins). A Blessing of Solitude by John O’Donohue, from Anam Cara: A Book of Celtic Wisdom, profoundly complements this theme by Derek Walcott. Here is an excerpt of Derek Walcott reciting his poem, Love After Love, in a new documentary film about him, POETRY IS AN ISLAND, by Ida Does. You can also see an interview with Derek Walcott by DBSTV St.Lucia in May 2014 in St.Lucia where he comments on the film. For more information on the film visit www.walcottfilm.com and check facebook.com/PoetryIsAnIsland for the DVD release date. Read a detailed description of this film about Derek Walcott at the new Poetry is an Island merchandise site. Update: On March 17, 2017, Nobel laureate, poet, playwright, and painter Derek Walcott died at age 87. Here are a few of the many articles that appeared in the world press: The Guardian, The New Yorker, The New York Times, The Los Angeles Times. I was surprised to see these comments from Derek Walcott in the Paris Review, Issue 101, Winter 1986: Derek Walcott, The Art of Poetry, No. 37. Since Walcott seems to equate poetry and prayer in this discussion, interviewer Edward Hirsch askes him how he writes. He describes it as withdrawing into a world of silence, and creating from there, as if in a trance, being blessed by “a kind of fleeting grace” if something happens. “But I do know that if one thinks a poem is coming on—in spite of the noise of the typewriter, or the traffic outside the window, or whatever—you do make a retreat, a withdrawal into some kind of silence that cuts out everything around you. … I’m not a monk, but if something does happen I say thanks because I feel that it is really a piece of luck, a kind of fleeting grace that has happened to one. Between the beginning and the ending and the actual composition that goes on, there is a kind of trance that you hope to enter where every aspect of your intellect is functioning simultaneously for the progress of the composition. But there is no way you can induce that trance. Author Steven Verney is interviewed by Dr. Cathy Gorini, Dean of Faculty at M.U.M. on the KHOE radio program “A Chat with the Dean.” Titled “The Best of all Possible Worlds” Steven Verney’s novel is based on his experiences as a teacher of Maharishi Mahesh Yogi‘s Transcendental Meditation. Steven sprinkles gems of Maharishi’s knowledge before the reader along with threads of life-changing experiences many teachers of TM will relate to while going about the business of bringing enlightenment to the individual and the world and balancing life in the “real world.” Readers have found it difficult to put down this well-written book. A generous percentage of book sales will benefit the David Lynch Foundation teaching Transcendental Meditation to at-risk populations. To find out more about Steven and his book, read this post and listen to an earlier interview on KRUU FM: Writers’ Voices interviews B. Steven Verney, author of “The Best of All Possible Worlds”. Visit Steve’s new website one of his son’s designed for him http://steveverney.com and blog. Read the overview of the book and see the Xlibris Book Trailer: The Best of All Possible Worlds. Steven is at work on his second book, about a lama that got away. The main protagonist is also a philosophy professor. I’ve read an excerpt and can’t wait to see the book when it comes out. If it’s anything like his first one, which I thoroughly enjoyed, then we’re in for another treat! And you yourself the flowing? New York poet laureate Marie Howe speaks with Krista Tippett about her poetry on the NPR show, On Being. Closing the interview, The Poetry of Ordinary Time, recorded In The Room, April 2013, Howe reads a poem in the voice of Mary, mother of Jesus, describing the Annunciation, which, her friend and mentor, Stanley Kunitz, said no one had ever gotten right. She wrote several versions, tore them up, and then this final one came through her. Marie Howe said it had nothing to do with her. It just came through her, a reminder that the best poetry comes through us when we get out of the way. When we are emptied of our small self, “by being no one,” transcend our senses and turn within and are open to the higher Self, then that great creative force of Love within us creates, and the miracle of life, of poetry, happens. 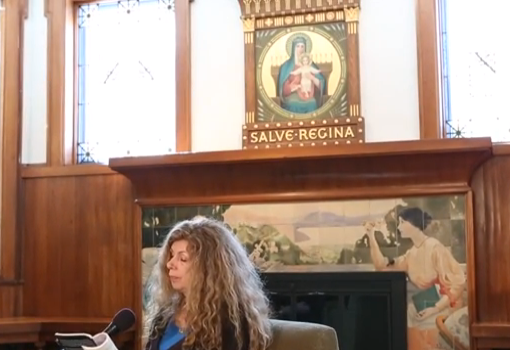 You can hear “Annunciation” by Marie Howe on SoundCloud. Thought this screen save from the video is most appropriate with the poster of Mother Mary holding the infant Jesus! from being loved like that. This amazingly beautiful and profound poem can be found at 1:36:02 at the end of the interview, but she starts talking about it at 1:34:45. There are more audio clips of Howe reading her poems posted at the On Being blog. They are also available on their SoundCloud, with other audio clips. Here is the complete unedited audio interview recorded on March 16, 2003, at the College of Saint Benedict in Saint Joseph Minnesota. Also see An Evening with New York State Poet Laureate Marie Howe. This relates: David Whyte describes the mysterious way a poem starts inside you with the lightest touch. Whyte also uses a biblical reference, comparing poetic revelation to Lazarus walking to the light. TM: Do you think of writing as a spiritual act at its core? MH: I do, because it involves a wonderful contradiction which is in order for it to happen you have to be there and you have to disappear. Both. You know, nothing feels as a good as that. Being there and disappearing–being possessed by something else. Something happening through you, but you’re attending it. There are few other things in the world like that, but writing is pretty much a relief from the self–and yet the self has to be utterly there.